In a region of extreme seasonal changes, with ice cold temperatures, days of 24 hour sunlight and harsh winds, its hard to believe an ice covered region could be home to so much Arctic Wildlife. Unlike Antarctica, the Arctic temperatures aren’t as cold, making it a more liveable habitat for many animals. Furthermore, the Arctic region spans across a range of countries and terrains, providing various different habitats for a range of diverse species. Here’s a list of just some of the wildlife you can expect to see on your Arctic expedition. Perhaps the most famous of all Arctic wildlife, polar bears are one of many animals you can’t find in Antarctica. They are earth’s largest carnivorous land mammal as well as the largest of the bear family. Surprisingly, polar bears actually have transparent fur that reflects light, giving the fur a white colour helping them remain camouflaged amongst the ice. The skin under their fur is actually black; you can really only see the black on their noses. As insulation, Polar bears also have a thick layer of fat below the surface of the skin; trapping body heat and keeping them warm in the harsh climate. Similar to the common red fox, but smaller, with rounder ears; the Arctic fox proves to be one of the most successful animals in the Arctic. An array of cold-conquering adaptations has helped the Arctic Fox survive temperatures below -50 degrees C. These include insulating fur and increased blood circulation to their feet, which stops their paws freezing to the ice. The white hue of their coat provides the perfect camouflage allowing them to blend in with the environment’s abundant snow and ice. When the seasons change, the fox’s fur changes colour into a brown or grey hue providing cover among the summer Arctic’s rocks and plants. Their ability to camouflage allows them to successfully hunt rodents, birds, and even fish. However, during winter prey can be scarce so the Arctic Fox follows the region’s premier predator—a polar bear—eating the leftovers from their kills. The Musk Oxen have inhabited the Arctic for thousands of years. At one stage they were facing extinction, however due to hunting restrictions and the reintroduction of the species in various regions, the Musk ox population remains stable. The long thick coat of the musk ox has allowed it to withstand the cold Arctic climate over time. The outer hairs of its coat, called guard hairs, cover a second, shorter undercoat that provides additional insulation in winter. This undercoat falls out when temperatures rise toward the end of winter. In winter, they use their hooves to dig through snow to graze on roots, mosses, and lichens. During summer, they supplement their diet with Arctic flowers and grasses, often feeding near water. Known as the unicorn of the sea, Narwhals are characterised by their swordlike spiral tusk. Narwhals actually have only two teeth, and for males, their more prominent one grows to an approximately 8ft tusk. It is not known what the purpose of the tusk is, however it’s believed by some that it’s used as part of some sort of mating ritual perhaps used to impress females or to battle rival suitors. Females also grow a tusk, however it’s not nearly as prominent as that of the males. Narwhals are known to travel in groups and feed on fish, squid, and other small aquatic life. They are often seen swimming in groups of 15 to 20, however gatherings of hundreds—or even several thousand—narwhals have been reported. Sometimes groups of narwhals find themselves trapped by shifting pack ice and fall victim to Inuit hunters, polar bears, or walruses. The Arctic hare is known to have been living in the Arctic since before the last ice age. The Arctic Hare is significantly larger and more heavyset than southern hares with adults ranging from 2 to 5 kg – heavier than an Arctic fox. Their fur is longer and finer than that of most temperate hares, and they have shorter ears. Such adaptions have allowed the Arctic Hare to survive in the harsh Arctic Climate. Because of their size, speed and fighting ability, pretty much the only predator to the Arctic Hare is the wolf. 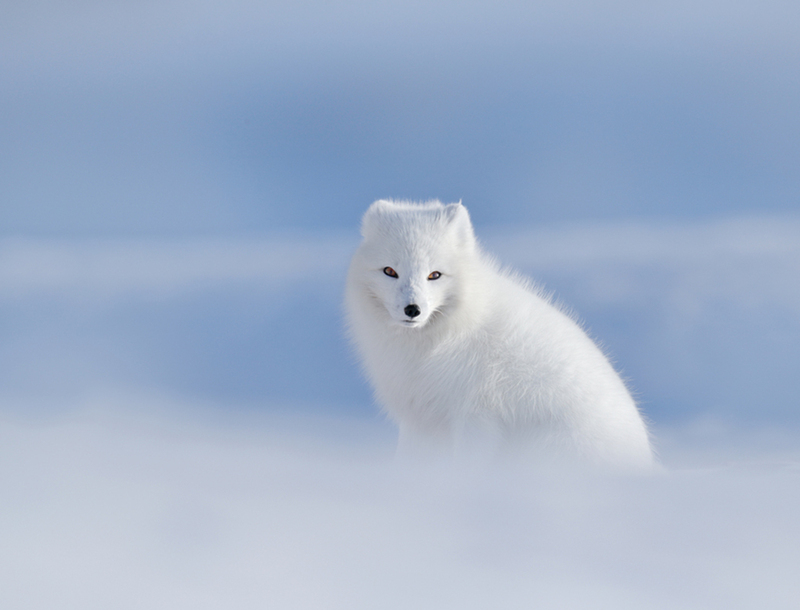 However, young arctic hares face predators including, snowy owls and Arctic foxes. In addition, the Inuit hunt the Arctic Hare, for their meat and hide, which is used for clothing and bandages. The Arctic is filled with an array of various land and marine wildlife, that can’t be found anywhere else. We’ve only mentioned a few, but you’ll be in awe of how many animals you see while in the chilly north. If you’re an animal lover, you’ll find the regions of the Arctic an excellent place for your next holiday.